Poker players are interested to know about poker chips and casino chip colors. Actually, there is no particular standard set when it comes to colors of casino chips for poker games. For the last ten years, there are many retailers providing sets of poker chips as the popularity of poker game is rising. 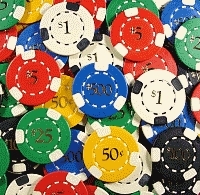 Due to mass marketing, sets of poker chips are produced with similar basic colors. This set usually consists of colors such as green, white, red and black chips. There are some sets, where you can also find chips in blue color. According to the general rule, all these colors fit the standard that people set for poker chips. For example, white color is used for $1, red for $5, green for $25 and the black one is for $100 chips. If you have seen blue chips, then these chips are for $10 or $50. Blue chips are unusual denomination of chips to be used in most casinos. The truth is that there is no standard when it comes to color scheme for poker chips worldwide. In places where casino is rampant such as in Las Vegas and Los Angeles, colors of poker chips may vary from one to another casino. In Las Vegas, you will see poker chips colors like white, red, green, black and purple. It is important for every player to know the corresponding amount of each poker chip. The colors mentioned above are universal, but take note that $1 chips can either be available in white or blue color. If you want to buy a set of custom chips, it is always recommended to choose the one with blue color chips for $1. The reason behind is that the white colored chips tend to be grime and dirt in some time. Poker chips are usually used in most of the games and you do not want your $1 chips to look untidy. Today, there are more colors of chips used in poker games and they are valuable in varying denominations. For example, you may find yellow chips for $20, orange chips for $50, pink chips for $250, light blue for $2000 and brown or grey for $5000. If you want to make your own poker chips for playing different games, you need to remember that you do not have to follow any certain rules or standards. If you like your $1 chips to be in purple color then have it purple. No one will argue with you for your choice of color. Designs and colors of poker chips might be specific according to the casino that they represent, but their weight is usually 10 grams. Maybe you want to know what is so special with chips made of ceramic material. Their advantage is solid body compared to the usual chips that you see in casinos. Ceramic chips are stronger and durable and it is impossible to tamper them. Many modern casinos in Las Vegas are using ceramic chips because it is hard to counterfeit a chip made from ceramic. They are also available in different shades of colors so you will not be limited when it comes to choice of color.